Villa Arjuna — hello, it's adela chloe. Although crowded and indeed very westernised, Canggu village was the perfect introduction to our first time in Bali. It has a little bit of everything. Yes, the roads are packed with scooters and barking dogs, there's an Australian owned bistro, spa suite or a concept store on every corner, and it can get a bit chaotic. However, we got to explore it all from the perfect central hotspot, or rather calm sanctuary. The beautiful Villa Arjuna. Owned by stylish Lena & Carlo – the contemporary wanderlust parents who also own the ever more contemporary Yoli + Otis brand – and featured by many media outlets including Condé Nast Traveller, we knew the villa was set to be as cool and stylish, and effortless as pictured. It has everything you might need and it’s an absolute Insta dream. Except one that delivers, for real. Need a good looking straw fan to go with your set up by the pool? Check. Need a beautiful dining table to host a fancy dinner? Check. Need a calm swing to read your book in shadow? Check. Need a coffee and fresh fruit platter first thing in the morning? Check, check, check. It’s tranquil setting boasts the views of neighbouring rice fields and local houses from the upstairs bedrooms. If you lust light, you will be happy here. The whole living area downstairs is connected and there are no curtains so it's filled with light. 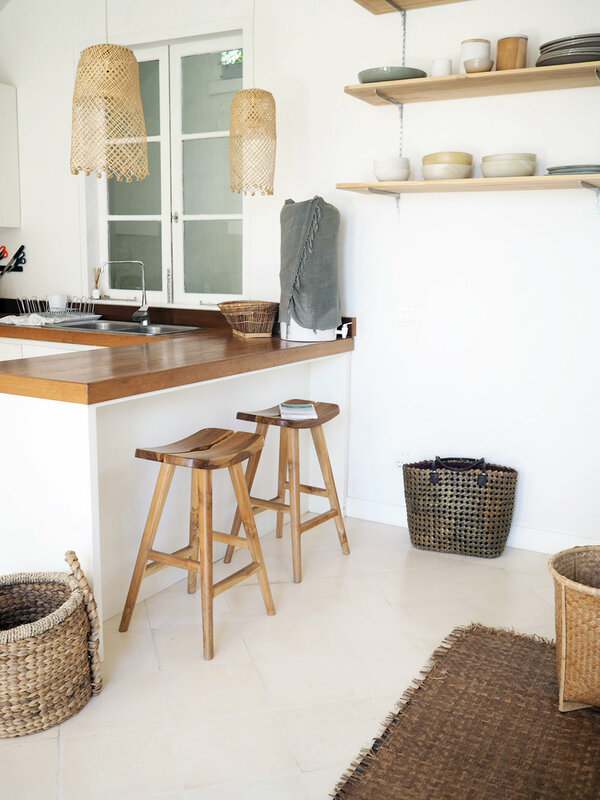 With lots of natural materials and its modern rustic charm, the villa boasts a beautiful Mediterranean, yet somehow Scandi-cool feel throughout. The house is hidden off busy Jalan Pantai Berawa, a road filled with cafés and boutiques, and is therefore the perfect central hotspot to explore all that Canggu offers, within a few minutes and scooter rides away. By walking you can easily get to the owners' Yoli + Otis shop, known vegan bistro Peloton Supershop, local Warung Gouthe with the best meat BBQ, or one of our favourite newbies in Canggu – Japanese cuisine house called Indigo. The ideal combination is to go as two couples, or a family. The upstairs master bedroom is connected to a kids room with two (smaller) beds, a balcony and a bathroom. The downstairs bedroom is separated from the living area and connected to it's own bathroom so offers great privacy. Airport pick-up and daily cleaning and gardening service is provided automatically and you can request a scooter rental or car & day trip service via the owners.